Home Case Studies Alex P.
Alex always vomited, at least from the time that I took her in. 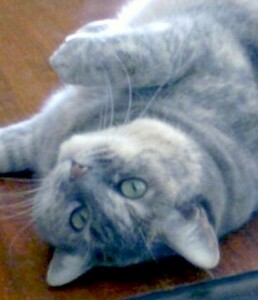 She was severely overweight due to her previous owner free feeding her junk. I had gotten her to lose some weight but looking back now it was most likely done too quickly. I’d never had this issue with any of my other pets before and had no idea about the dangers to their system if they lost weight too fast. In the fall of 2006 I took her in for a checkup because of her vomiting and at 17 pounds, I learned of the severe consequences of her being overweight. She needed to be on a strict diet and monitored very carefully. I bought a baby scale and agreed to email the vet weekly with updates on Alex’s weight and progress. It was a difficult process but it was going okay. In the spring of 2007 Alex seemed to be gaining weight again and had a small, two day bout with vomiting. I took her to the vet where she was given the proper tests and checked over well. I was told to give her Pepcid A/C to calm her stomach and see how the tests came back. When everything came back normal she seemed to be doing alright again and we kept going with her diet the way it was. Keep in mind that I was oblivious to the damage that numerous grains and sugars in pet food could do to their systems. This was all new to me and even though she was eating less, she was still gaining weight. This was also at the time of the massive pet food recall due to melamine poisoning and we could never be sure if that was a contributing factor to her getting so sick, this quickly. So even though I thought I was feeding her better food, she was never going to lose that weight as long as she was eating it. Of course by the time I figured this out, the damage was done. All was fine for many months and she hadn’t vomited in quite awhile. But in late February of 2008 everything changed. She had a severe bout of vomiting that lasted three days, and because she couldn’t hold her food down any longer, she stopped eating almost completely. I finally took her to the vet after three to four days of not eating anything but hand-fed boiled chicken. After running the normal blood and glucose tests to check for diabetes, parasites, etc., she was given some fluids and a mirtazapine as an appetite stimulant. At first she reacted well to it and came home to eat a hardy meal for the first time in days. I thought this was wonderful and felt pretty relieved. Within hours that changed to hysterics as Alex began to have a bad reaction to the drug and I ended up bringing her to the ER. Mirtazapine is a human anti-depressant and tends to make people crave food and eat voraciously. One possible side effect of the drug is called seratonin syndrome and Alex had it. Her heart rate was up, she was restless, pacing and crying, hiding in the corner of the room. Her pupils were huge, she looked like she was stoned and her breathing was rapid. I raced her to the ER where she was given the antidote, which happens to be another appetite stimulant, cyproheptadine (Periactin). It turned out that one dose wasn’t enough and I had to take her back to the vet the very next morning for more and to be checked over. She was okay but I was given a prescription for the cyproheptadine in place of the mirtazapine. I was told that this was a rare reaction, but it scared me so much it was the beginning of my desire to research and ask a million questions about every little thing we did for her. Even that turned out to not be enough as there were more problems to come. As the years have gone by we’ve seen a lot more of this reaction to mirtazapine in other cats. No drug is without it’s problems and side effects though and even cyproheptadine can cause reactions but not as often as far as I know. In early March they did an ultrasound on her and found her liver to be inflamed, but not yet hepatic. Her pancreas looked okay, all other organs and lymph nodes looked normal, but her small intestines showed thickening and she was diagnosed with IBD. She was immediately put on metoclopramide (Reglan) for motility and to stop vomiting. The Reglan and Pepcid (famotadine) helped greatly but she was now incredibly sensitive and would still vomit every couple of days. She was losing weight quicker now and by March 19, 2008 was down to 13½ pounds and was vomiting bile. I began to have my chiropractor make house calls and give Alex adjustments. It seemed to give her immediate relief but within 24 hours she would actually get worse. We decided to try prednisolone and after the first dose she ate voraciously for a week or so. Then her appetite decreased again so we decided to try metronidazole (Flagyl) instead of the pred. I was also taught how to give her lactated ringers (fluids) at home to help flush her everyday and keep her hydrated. I was also giving her Reglan and Pepcid through injections. Again, for the first few days, she seemed to be doing well on it. On the night of April 7th, Alex had a seizure. I had never seen an animal have a seizure before and I was never so scared in my life. She was lying on the bed with me, her eyes were staring at me but she couldn’t seem to see or hear me. She was twitching all over the place and I didn’t know what to do. I put her on the table and gave her some fluids to try and snap her out of it. I never went to sleep that night, first thing in the morning I raced her to vet’s office where Alex was now jaundice in her ears, eyes, throat, nose, her stomach, everywhere. She was now severely hepatic and needed hospitalization. The usual treatment for this is to hospitalize an animal for at least three days on a slow IV drip of fluids and antibiotics. Because this isn’t an all night hospital I would have had to bring her there, pick her up, drop her off somewhere else, pick her up in the morning, bring her back to the vet, etc. etc. This would have been enormous stress on her and I couldn’t afford it. So I opted to drop her off at the vet in the morning and leave her for the day for three to four days. That first day I left her, I came home and prepared myself for the worst. I thought for sure I was going to lose her. When I went to pick her up that night she looked a lot better and she was actually talking up a storm in the back room. Everyone said she was snapping out of it and was giving them a lot of grief. Which in the vet’s eyes is always a good sign, it means they’re still fighting. By the end of the fourth day we had her back on prednisolone and now on amoxicillin (antibiotic) in addition to the Pepcid, Reglan and Cyproheptadine. I had to switch her food around constantly to try and find something that she either wouldn’t vomit back up or she liked and would come back for. The trouble is that if a cat vomits a particular food enough times they aren’t going to want to eat it again. 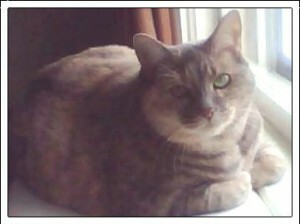 By May of 2008 she was eating Fancy Feast and Royal Canin Recovery. She was doing well on it but still losing weight and was now over-grooming herself. She was still jaundice and even though she wasn’t particularly constipated she began vomiting right after going to the bathroom. By June 2nd, 2008 she was vomiting so much that her weight was now at 9½ pounds. Instead of dragging her to the vet in the car I requested the vet do a home visit, which wasn’t cheap. But Alex was already vomiting enough and she threw up in the car every single time I brought her out. During the home visit I requested they do blood work for B12 deficiency and pancreatitis. They also suggested I start her on FortiFlora for probiotics. The new regimen was to be a .25 mgs B12 injection once per week, folic acid, some B complex, thiamine and Denosyl, which is used for the liver. When the results came back her liver enzymes were again elevated, she did have pancreatitis and even though her B12 came back normal I not only kept her on it but I increased the dose to .50 mgs per week. On June 11th we decided it was best to insert a feeding tube into her stomach via her neck. I feared since she was already so thin and having problems that maybe she wouldn’t make it through the surgery. Not only did she make it through but she was doing great. Using the feeding tube took some getting used to on my part, but she was okay with it, doing very well. When I took her back into the vet for a recheck the vet showed me how to change the dressing on her neck and said that everything looked very good. After a couple of weeks she was still losing weight and at this point she was literally ripping her fur out all over her body. At first we thought maybe it was allergies or her immune system being compromised but the vet said it was most likely a sign of OCD (obsessive compulsive disorder) usually associated with pain. I now know that’s true but also pred can cause this, I don’t know why. So on July 2nd I took her in and asked if we should put her on something called Actigall (ursodiol), which seemed to work well for other cats. The vet was so impressed with her coloring that she didn’t want to “rock the boat” and said in her opinion we shouldn’t do it. She said her jaundice was drastically improved, her coat was luxurious and soft and her eyes looked brighter. She had already taken on Buprenex for the pain after surgery so we put her back on that as needed. After that she started vomiting once every day, mainly fluid and hair. Her stools were extremely large and pale and I now know she must have had EPI (exocrine pancreatic insufficiency). Had she been treated for that properly, it could have made a difference. On July 10th she woke up and ate her breakfast, seemed to be okay. Within four hours time she began to have rapid breathing, her third eyelid (the filmy covering in their eyes) was visible, she was very much in pain and seemed distressed. I raced her to the vets where she told me she didn’t look good. She was now down to 9 pounds and in a lot of pain. They put her on an IV hookup and she just lay there, she didn’t care anymore. The vet didn’t understand it either but she had a high fever and it looked as if she had developed an infection somehow. Within an hour her temperature dropped and she seemed to be stabilizing. The vet didn’t want to make any decisions about care or what was going to happen because she had bounced back so many times before. I was advised to bring her to the nearest hospital for this kind of thing in animals but that was over 50 miles away. She would never had made it. I promised to do what I could at home and then bring her back first thing in the morning. I brought her home and she continued to decline rapidly. She was lying on my bed, breathing rapidly. Every time I tried to move her she moaned in pain. As a last ditch effort I put her in the carrier and raced to the ER. She passed away in the car on the way there. For a kitty who was so sick, she fought very, very hard and so many times she pulled through. When she passed it was a shock and it devastated me more than I can say. In hindsight there are many things I wished I’d done differently. Although all I did was research these diseases on the Internet, at the time there wasn’t enough information about these conditions and it was incredibly confusing. I would have immediately put her on Denosyl at the first sign of the inflamed liver and got her enzymes levels down before it had gotten out of hand. By waiting to start the treatments almost six months later, the damage was already done. She was already hepatic and it was too much stress on her body to try and turn things around at that point. Her liver had affected her pancreas and she was producing too much bile. I also would have gone with my gut and given her the Actigall instead of waiting on that as well. It’s a drug that helps with liver enzyme levels and can also help alleviate some of the symptoms of pancreatitis. I would have tried giving her Entocort (budesonide) instead of Prednisolone or Flagyl but I didn’t know about that drug at the time. It takes much less processing through the liver and I think it would have been better suited for Alex than prednisolone. All drugs have side effects and she certainly had her share of problems with medications. I would have started her immediately on B12 injections from the moment she lost her appetite. I’d have given her slippery elm bark orally to help coat her GI tract and calm the nausea. Her diet would have surely been different. No grains, all wet food, maybe even raw if I could have gotten her to eat it. But homecooked could have been done I’m sure. It’s hard to look back now and say what I would have or could have done. But the purpose of this is for others to understand how fast things can go south with this disease. That some of these steps should be considered and discussed with your vet at the very first signs. Don’t wait until it’s too late to start these treatments.